Lets go for another recipe! Over the past few months I’ve been enjoying experimenting with making Hummus. 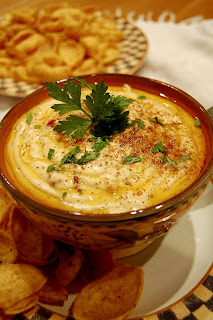 Hummus is a Middle Eastern condiment or dip and is made up primarily of chickpeas, Tahini (sesame paste…see below), lemon juice, and olive oil. With our Middle Eastern roots (Armenia) I have enjoyed exploring its cuisine. Hummus is a staple in Armenia. Hummus and pita (or other crispy type stuff made with grain) not only makes for a great addition to your Mediterranean meal but also works with many other menus or just as a snack. I’ve made it a number of times and we all enjoy it...practically all of us anyway. Aaron’s like, “who wants to eat puréed beans?”. I must confess I do use the canned, already cooked chickpeas when I make Hummus. Not only are they much more readily available than dried ones, but they are a whole lot more convenient. 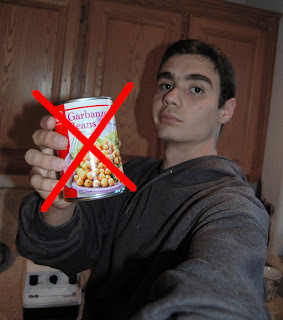 Whenever you feel like Hummus, just pop open a can and blend it up...you can skip the whole bean cooking process. Although I’m sure cooking them yourself will be more authentic tasting. So, I recommend doing that…even though I don’t myself! :) Where on earth do you buy dried chickpeas anyway? If you have a good resource then let me know. So what does it take to make good Hummus? Well, you need a blender. You also need practice. Make a few batches and get the amounts dialed in to you liking. How much and how little of the different ingredients to use is really a subjective thing. You might like the consistency more thin than thick, you might like it extra lemony, or you might like only a hint of the Tahini. After you’ve made a few batches you’ll get a feel for the amounts, but here’s something to go off of to get you started. I think maybe this probably might make about 3 cups. Perhaps. Maybe more? Maybe less? Put all the ingredients in a blender and let it rip. Yahoo! I like it smooth, so I run that baby for a little while. If the blender is having trouble, there’s no problem in thinning it out with a little of the reserved liquid from the chickpeas. I like to add some fresh ground cumin to taste and drizzle olive oil on top. You could also sprinkle some chopped parsley on top. Now I want to share with you some ways to spice it up a bit. This is where it gets fun. What I gave you was a basic foundation, and don’t get me wrong, that’s good just by itself like that. But how about adding another element? Another flavor? Yeah, that sounds good! What would be good to add? Well here are some suggestions. Most of these I have done. Kalamata olive: Hand chop some Kalamata olives (like a ½ cup of whole, pitted olives) and stir them in at the end. See the end of this post to learn about Kalamatas. This Hummus is one of my favorites. You can top it with some parsley. Roasted Garlic: Roast a head of garlic and lightly blend it in at the very end. You might even just chop it by hand and stir it in. Roasted pepper: Either use a red bell pepper or somethin’ with some spice like an Anaheim or a couple Jalapeños. Burn the skin of the peppers underneath your broiler, over your gas stove, or on the grill. Then peal the burnt skin off and remove the seeds if you haven’t already. Lightly blend them into the Hummus. Lime Sub-lime: It’s not Jamba Juice, but it’s good! Substitute lime for lemon in the basic recipe. You might use a little less lime. Top the Hummus with cilantro. Sun-dried Tomato: Lightly blend in some sun-dried tomatoes at the end! Spicy: Spice it up! Add a ¼ teaspoon or so of cayenne. Have fun experimenting and enjoy. All Tahini is, is hulled sesame seeds that have been ground up. It’s kind of like peanut butter only sesame. Tahini is really not very good eaten by itself (it’s a little bitter) but you gotta have it in your Hummus. If you can find it, get it unsalted. Which brings us to our next topic: where do you get it? We actually have gotten ours from the Azure Standard food co-op. I really like and recommend the MaraNatha brand Tahini that they sell. So buy that kind. Then you can say, “I have the kind that Peter recommended.” And that would just be really cool. If you don’t do Azure, you can pick it up here. Whole Foods also sells Tahini under their 365 brand. There is such thing as Asian Tahini, and that is made with unhulled seeds. Congratulations for reading this far! Go to the comments for a couple tips and tricks! 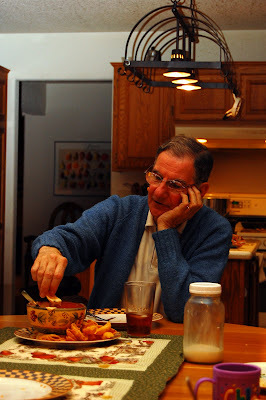 My Armenian Grandpa enjoying a Sundried tomato Hummus that I made. He remembers eating Hummus growing up. Tip #1: When adding everything into the blender, put the olive oil in, then measure the Tahini in the same cup. That way it won’t stick! 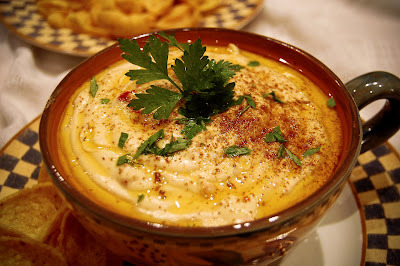 Tip #3: There are a variety of things you can use to dip in the Hummus and to eat it with. The best probably being toasted pita bread. I'll post a recipe for that soon. Frito chips are actually really good with Hummus. If you shop at Sam’s Club you could get their big bag of bagel crisps. And Tortilla chips are fine in a pinch. Various types of crackers are good as well. Thanks for the recipe, Peter. Something else that is really good with hummus is baked pita chips from Costco. It's probably a lot like the toasted pita bread, but we haven't tried that yet.